[138 Pages Report] The digital isolator market is expected to reach USD 2.07 Billion by 2023 from USD 1.38 Billion in 2016, at a CAGR of 6.0% between 2017 and 2023. The base year considered for the study is 2016, and the forecast period is between 2017 and 2023. The objective of the report is to provide a detailed analysis of the market based on isolation type, data rate, channel, application, vertical, and geography. The report also provides information regarding the major factors influencing the growth of the digital isolator market (drivers, restraints, opportunities, and industry-specific challenges), along with the detailed value chain. In addition, the key players in the market have been strategically profiled, and their market ranking and core competencies have been comprehensively analyzed, along with detailing the competitive landscape for market players, and the strategies such as product launches and developments, acquisitions, partnerships, agreements, and collaborations adopted by them to grow in the digital isolator market. This research study involves an extensive use of secondary sources, directories, and databases (such as annual reports, press releases, journals, Technischer Überwachungsverein (TÜV), Institute of Electrical and Electronics Engineers (IEEE), company websites, and other paid databases) to identify and collect information useful for this study. The entire procedure includes the study of the financial reports of top market players. After arriving at the overall market size, the total market has been split into several segments and subsegments and confirmed with the key industry experts, such as CEOs, VPs, directors, and marketing executives. The figure below shows the breakdown of primaries based on company type, designation, and region conducted during the research study. Texas Instruments, Analog Devices, Infineon Technologies, Silicon Labs, Broadcom Limited, ROHM Semiconductor, Maxim Integrated, NXP Semiconductors, NVE, Vicor, Murata Manufacturing, National Instruments, IXYS Corporation, Halo Electronics, and Advantech are some of the major players in the digital isolator market. The digital isolator market is expected to be valued at USD 1.46 Billion in 2017 and is likely to reach USD 2.07 Billion by 2023, at a CAGR of 6.0% between 2017 and 2023. The growing demand for noise-free electronics and the increasing usage of renewable energy sources are driving the growth of the market. Further, digital isolators are increasingly being used as a substitute for optocouplers; this is contributing to the growth of the digital isolator market. However, digital isolators’ inability to transmit low-frequency signals without the use of modulators and their high costs are restraining the growth of this market. The demand for digital isolators for use in gate drivers is expected to grow at a high rate over the next 6 years. Gate drivers accounted for the largest share of the digital isolator market in 2016; the market for gate drivers is expected to grow at a high rate during the forecast period. This market growth can be attributed to the wide use of gate drivers in engines of electric vehicles and the large-scale electrification of automobiles in developed economies, such as the US, Germany, Japan, and the Nordic Countries. Gate drivers are also used to drive motors in the industrial sector. The market for giant Magnetoresistive (GMR)-based digital isolators is to grow at the highest rate between 2017 and 2023owing to its wide use in biosensors and microelectromechanical systems (MEMS), among others. The devices featuring this isolation type exhibit enormous change in resistance when subjected to a magnetic field. This change in resistance on the output side of the devices results in large output signals offering enhanced accuracy and sensitivity. 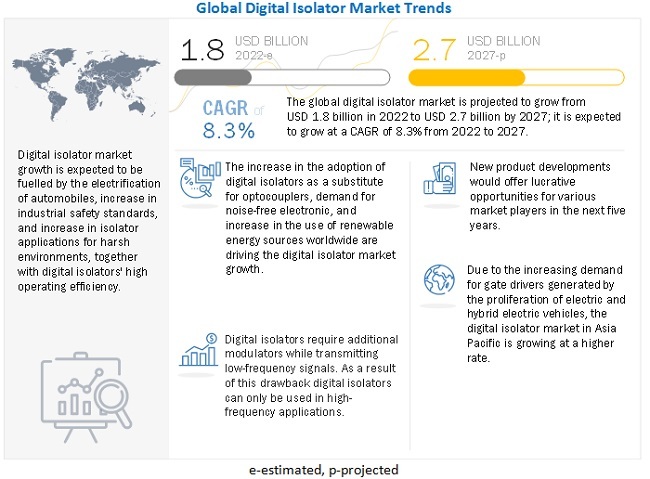 Asia Pacific is expected to hold the largest share of the digital isolator market by 2023 owing to the presence of a large number of major electrical device and equipment manufacturers in this region. In addition, several electrical component manufacturers are shifting from North America and Europe to Asia Pacific to capitalize on the low direct costs incurred in China and South East Asia. Some of the key players in the digital isolator market are Texas Instruments, Analog Devices, Infineon Technologies, Silicon Labs, Broadcom Limited, ROHM Semiconductor, Maxim Integrated, NXP Semiconductors, NVE, Vicor, Murata Manufacturing, National Instruments, IXYS Corporation, Halo Electronics, and Advantech. These players have adopted various strategies, such as product launches and developments, acquisitions, partnerships, expansions, agreements, and contracts, to grow in the market.